One of the biggest challenges on the total elimination or FODMAP diet is finding baked goods and easy-to-grab snacks that taste good. “Always on the run” is part of the lifestyle with kids and in order to adhere successfully to these limited diets, it’s important to stock items that you can have at the ready or take to activities and in the car. 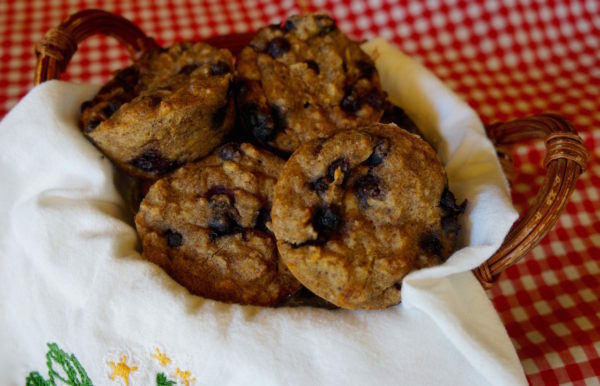 These muffins fit the bill — and they are dairy-free, nut-free, gluten-free and egg-free. I like to bake a big batch and freeze half, so we always have them on hand. 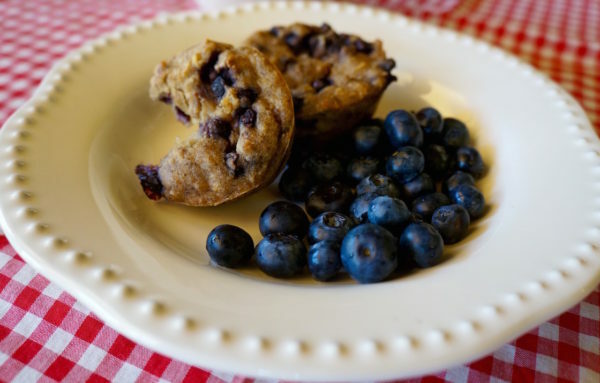 This is one of our favorite snacks, plus they’re perfect for a quick breakfast too. Combine the flours, baking soda and cinnamon, then mix this mixture into the other. Fold in 1 -1 ½ cups of your choice of small or chunked fruit. Frozen organic blueberries work great. Spoon into muffin tin. – Substitute the applesauce and 1 banana for 4 bananas. To prep the bananas, cut into chunks, add the 1/4 cup of olive oil or coconut oil is fine too, and cook in the microwave for 2 minutes to soften and release the flavor. Then mash with a potato masher. – Eliminate the flaxseed meal. – Pecans and walnuts are also okay on the FODMAP diet and good to add if you would like to. Almonds are a no-no, however. P.S. Like pancakes for breakfast? Check out our recipe for “Pure-fect Pancakes”! P.P.S. Do you have any “total elimination” or “FODMAP diet” recipes you like? Please share!! Email me at angela@momstylelab.com.